Back at Christmas 1995, I recorded the Channel 4 transmission of England, My England, a drama commemorating the threehundredth anniversary of the death of Henry Purcell. It was promoted as John Osborne's last screenplay, though it was actually uncompleted at his death and finished by Charles Wood, and its commercial release has emphasised the director, Tony Palmer, rather than the writer. I'm finally watching it now, only sixteen years late. The screenplay's argument parallels Restoration England with Britain in the 1960s and after, with nonchalant anachronisms from the 1990s intruding in the 1960s scenes - mentions of the 'British Library' and post-1985 editions of Penguin Classics in characters' hands - just as the reign of Charles II is imagined through the concerns of an actor-playwright uninspired by a failed production of Bernard Shaw's In Good King Charles's Golden Days. Simon Callow is both the playwright and Charles II, but it was the 'brave' casting which caught the attention at the time, EastEnders's Sharon, Letitia Dean, playing Barbara Villiers, and most controversially Michael Ball playing the adult Purcell, whom I've not yet reached. Purcell's music accompanies and punctuates the whole; the depiction of circular time is underlined by the mixture of model shots and stock footage (from, I think, Gone with the Wind's burning of Atlanta) to represent the Great Fire of London, intercut with documentary footage of anti-Vietnam protests) and by the name of the play-within-a-play's producer, played by latterday West End producer Bill Kenwright but here named 'Bill Betterton', identifying him with the seventeenth-century actor-manager Thomas. Odd to think that this was commissioned by Channel 4 on the eve of the era of The Big Breakfast and its modern populism. The excellent Popular blog on the FreakyTrigger site, chronicling the UK pop charts, number one by number one, has reached Doctorin' the TARDIS. Columnist Tom's somewhat self-conscious analysis is balanced by many of the longer comments, which are worth looking for further down the page. As for what I thought at the time... see the article headed 'Timelords Record Shunned?' on this page from a 1988 Celestial Toyroom. 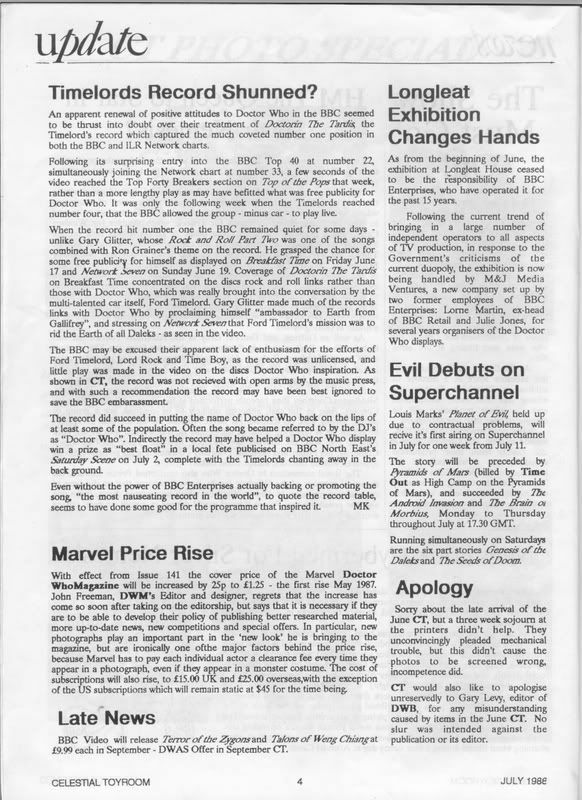 There's probably more to be said on the junctures and disjunctures between this record, the state of Doctor Who in 1988, and the place of the programme in popular culture in the late 80s, but not by me (at least not now). Plenty of nods to the Timelords and to Orbital, I think. EDIT: Kate Rusby performing The Bitter Boy at the Cambridge Folk Festival this year.